Statistics show that approximately half of all Americans make self-improvement resolutions. They also show that the majority of resolution makers, though optimistic on January 1st, admit to giving up on their goals by January 17th. Why do people find it so difficult to follow through on New Year’s resolutions when many are determined to succeed? Although one study showed that one is more likely to make a change when a resolution is made, it’s difficult to replace unhealthy habits with better ones, and it takes more time than one might realize. Apparently only eight percent stick with their plan for three to six months, the time is takes to rewire the brain to change the behavior. Per research published in the Journal of Clinical Psychology, top resolutions include weight loss, increased exercise, smoking cessation, improved money management, and debt reduction. 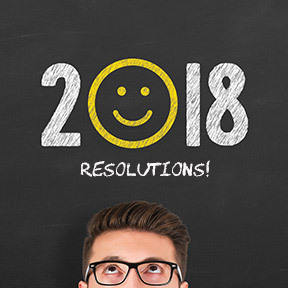 Though resolution making tends to have a high failure rate, if you’re losing steam, there’s still time to reboot your resolve, and restructure your approach to attain your goals and initiate lasting change. While we may decide to implement change with every new year, a commitment to new behavior is an ongoing process. Since many people give up when the goal requires too much effort and attention, or when change doesn’t happen quickly enough, some advocate setting less lofty goals to increase the chance of success. Choose one goal that is most important to you. It appears that setting one tough goal may be easier to achieve than several less challenging ones. Rather than spreading the focus over several resolutions, setting one specific meaningful goal, that can be broken down into smaller achievable steps, is a more measurable, realistic and motivating approach. Once a new behavior is built, you can focus on the next one. Don’t rely on will power alone. Resolutions fail for a variety of reasons. One reason is that we may frame our resolutions in a negative way. Rather than a reliance on willpower to stop a behavior, focus on a positive action that you can perform to replace the old behavior. It appears that we don’t have unlimited amounts of willpower, a form of mental energy that is used up as we exert self-control. One study suggests that once we overcome the struggle to develop a good habit, the habit becomes automatic, meaning we don’t have to exert much self-control to maintain the behavior. Make the end goal very specific. If the goal is too vague or too general, chances are you won’t succeed. A detailed plan for what actions you will take to see your resolution through is not only necessary, but will highlight other things that may get in your way. For example, if you really want to work out three days each week, be sure to schedule it at a time when nothing else will interfere. Build an environment that promotes good habits. Your current lifestyle is largely a product of your environment. Habits are easier to change when one’s environment is designed for success. If your plan is to eat healthy, fill your cabinets and fridge with foods that fit that plan. A pantry full of sweets and refined carbs is sure to sabotage any good intentions. Think small. Achievements don’t need to be huge to have a positive effect. Repeated patterns of small changes can add up to significant results. Small choices we make everyday can make our behavior a little bit better or a little bit worse. Similar to gently starting a new exercise program, build consistent behavior first, then concentrate on increasing the intensity. Vitamin D3 5,000 IU: This formula provides highly bioavailable vitamin D3 as cholecalciferol in support of calcium and phosphorus regulation, immune health, and the development and maintenance of healthy teeth and bones. Gluten free, Non-GMO formulation. Melatonin 3 mg: Melatonin 3 mg supports the onset of sleep, better quality more restful sleep, and more balanced sleep/wake cycles. Regular quality sleep supports better mental, physical and emotional health and helps reduce irritability and fatigue. Gluten free, Non-GMO formulation. CoQ10 100 mg: This highly bioavailable Coenzyme Q10 provides support for cellular energy production, as well as antioxidant support for cardiovascular, immune, periodontal, and liver health. Gluten free, Non-GMO vegetarian formulation. OmegaPro-D: This high yield superior quality formulation provides wild sourced EPA and DHA essential fatty acids and bioavailable vitamin D3 in support of immune function, neurological performance, and cardiovascular, joint and skin health. Gluten and soy free, Non-GMO formulation. Vitamin C+: This synergistic formula provides vitamin C in a buffered ascorbate form, bioavailable minerals necessary for absorption and utilization of vitamin C, and mixed citrus bioflavonoids in support of immune health, collagen maintenance, and red blood cell formation. Gluten free, vegetarian formulation.